On the opening of the Onigiri* shop “Rice-Up” in the U-bahn station Schönleinstraße, Stiftung FREIZEIT was invited to make a temporary setting for the occasion. 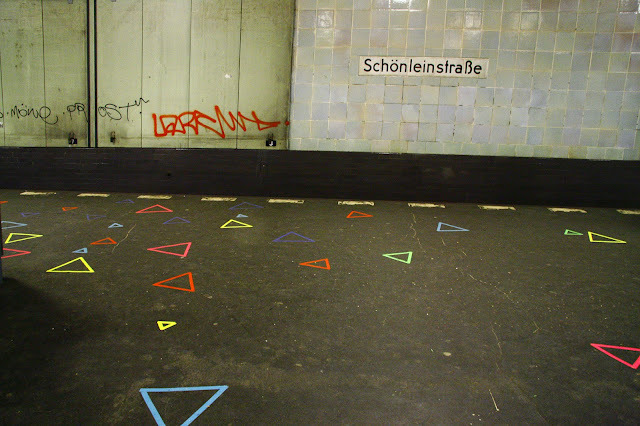 Like a new invasion, colourful triangles were spread all over the station. Right from the entrace and then downstairs, they led people to the hotspot. Many friends and passers-by joined the party on the platform: cosy, no snow or wind, and with a new bunch of curious people getting off the train every 5 minutes! A day with 3 corners! * Onigiri are triangular rice japanese snacks.